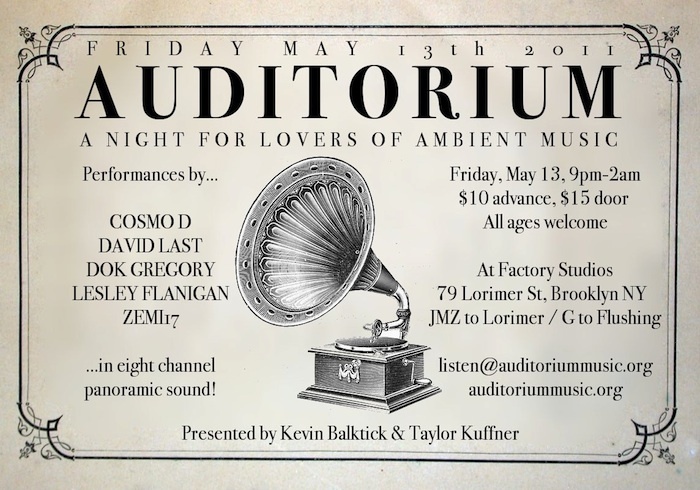 This Friday May 13th, Kevin Balktick and Zemi17 (Dubspot Electronic Music Production Instructor and Ableton featured Artist) present AUDITORIUM, a new music series for lovers of ambient, experimental, downtempo and slow electroacoustic sounds at Factory Studios in South Williamsburg, featuring an Ableton controlled 8.4 uber surround sound system. For the debut installment, AUDITORIUM: EPISODE ONE, expect an evening of inspired music, immersive eight-channel sound, enchanting lighting, surreal decor, unique elixirs and warm hospitality. Performers and audiologists for the evening are Cosmo D, playing cello through ableton with hi paced broken beats, David Last as Pocket Pet, performing with Native Instrument’s Maschine and Ableton, Dok Gregory, on SH101 vintage synthesizer, Sherman filter banks and theremin, Lesley Flanigan, performing with her voice augmented through max patches, and Zemi17, the creator of multi-point syncopated frequency dynamic visceral sound live sets performing on EWI4000 Midi Breath controllers and Ableton Live. $10 advance, $15 door. All ages. At Factory Studios in South Williamsburg. 79 Lorimer St, Brooklyn, NY. JMZ to Lorimer, G to Flushing. In this video, Dubspot Electronic Music Production Instructor, Ableton featured artist, composer and musician AaronTaylor Kuffner aka Zemi17, the co-creator and art director for the Gamelatron, the world’s first fully robotic gamelan orchestra, talks about “the flow from nothing to sound” — using Ableton Live and Max MSP to control the Gamelan Orchestra. This video was shot during preparation for a special live presentation at St. Cecelia’s Convent in North Brooklyn, as part of Rabid Hands Sequence of Waves. Contemporary ambient, experimental, electroacoustic and downtempo music created in and around New York City. AUDITORIUM’s founders and directors are Kevin Balktick and Taylor Kuffner. Kevin Balktick is a designer and producer of imaginative experiences and culture events, including the Winkel & Balktick warehouse parties, The Lost Horizon Night Market andHorizons: Perspectives on Psychedelics. Taylor Kuffner (aka Zemi17) is a sound designer, media artist and composer who has performed across the world. Most recently, he is the creator of the Gamelatron, a MIDI-controlled robotic gamelan orchestra. GREG ‘COSMO D’ HEFFERNAN is a producer and cellist who’s background in classical music, jazz, studio production, and electronic music have given him a distinct musical identity. On stage, his cello improvisations combined with bass-influenced electronic dance music and DJing provide a one-of-a-kind listening experience. In the studio, both solo and as 1/3rd of the production crew Archie Pelago, he melds electronic and acoustic instruments with original beats and textures, always providing an emotionally impactful vibe to his ever-evolving sonic palette. DAVID LAST is a musician and visual artist living in Brooklyn New York. He is a founder of the Konque label and music project. His tracks range from electronic dance music to cinematic orchestral ambience depending on the setting. This is not surprising, as he has been creating music for a variety of venues; the dancefloor, Imax film, video installation, childrens’ animation, and albums. As a result of a broad curiosity about music, each project is considered anew as its own sonic world. 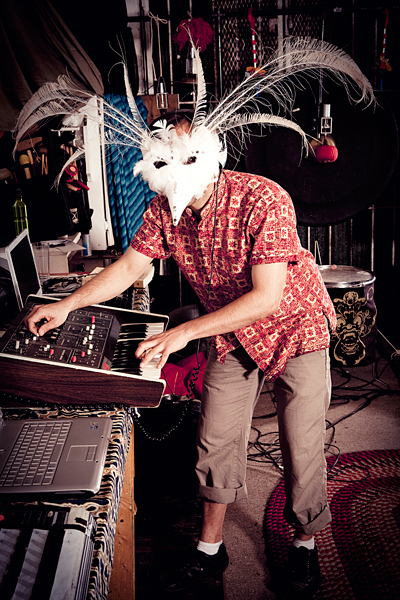 DOK GREGORY has been composing, performing and recording experimental electronic music since 1983. He has toured and performed in festivals throughout the United States, Europe, Russia and South America. Dok’s audio-visual works have been featured in programs at the Forum Des Images in Paris, Basel Art Fair in Switzerland, The Kitchen and Lincoln Center in NYC, to name but a few. In 2007 he began work on the ISRS system (a shortwave radio synthesizer) and continues to research, development and deployment the technology. Dok has also toured and collaborated extensively as a member of Silence Corporation, Psychic TV, Trance Pop Loops and the Ransom Corps. ZEMI17 is a composer, musician, sound and installation artist based in Brooklyn, NY. He is the co-creator, composer and art director for the Gamelatron, the world’s first fully robotic gamelan orchestra. He is a featured artist of the Berlin software company Ableton Live, teaches audio production at Dubspot, performs with the group Zero Gravity Thinkers, and is the resident DJ for the legendary Danger warehouse parties. He has received grants and awards from the Mid Atlantic Arts Foundation, The Trust for Mutual Understanding, New York State Council on the Arts, Indonesian Foreign Ministry, The Berlin Arts Council, EU / European Commission, James F. Robison Foundation, and The Soros Foundation.